Is geography one of those subjects that you teach just because you should? Never really expecting your students to learn. It doesn’t have to be! Introducing: The Geography Drawing Series! 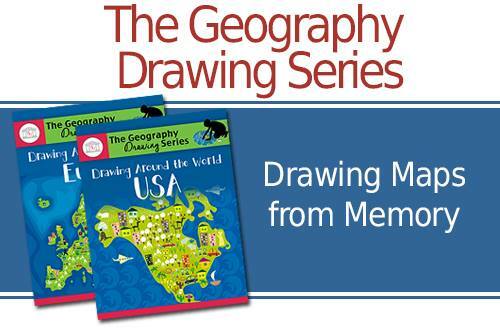 The Geography Drawing Series is a simple, yet extremely effective curriculum that teaches children geography. How are you going to coordinate history with geography? How are you going to make time for geography? Are your students really learning geography as they trace routes and identify locations on a map? How are you going to coordinate geography with history? You won’t! Your student will! Sometimes we over think and over teach. And when we do, we risk taking the joy of discovery away from our students. That’s one of the many benefits of The Geography Drawing Series. If the student has memorized the countries of Europe, and is reading about the travels of Marco Polo, he can easily imagine the route in his mind. And when he sees the route on paper, it will actually make sense. With this book, geography and history are separate. You can now fit geography into your schedule whenever it suits your families’ needs! In only a few minutes a day, you can do geography anytime. 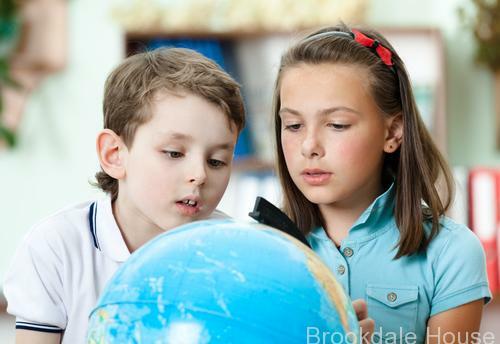 Are your students really learning geography as they trace routes and identify locations? If your students are like mine, the answer is no. 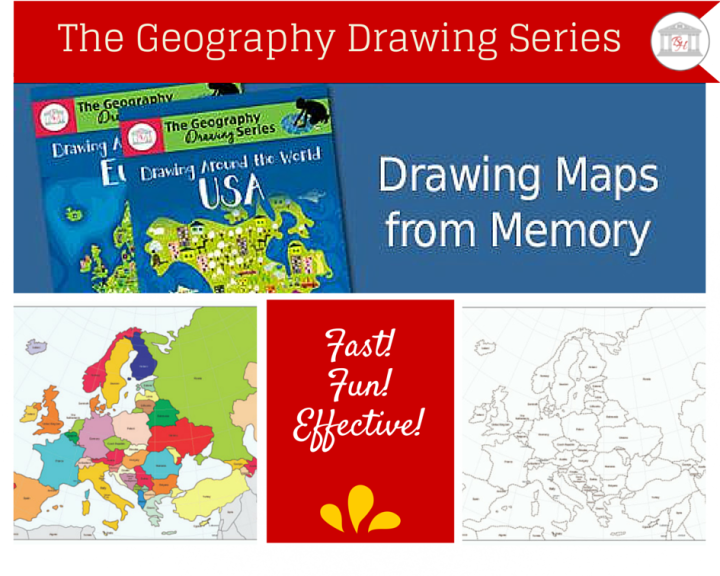 Students don’t have to trace routes with The Geography Drawing Series. They are going to learn geography by actually learning geography. No more random lines that students forget as soon as they put their pencils away. The Geography Drawing Series Learning Objective! To help students learn the names and relative positions of the European countries, students are asked to illustrate, from memory, the individual countries and their locations. Answer: No problem! Keep reading. Drawing Around the World: USA is also available! Although this is a geography curriculum that utilizes drawing, it is not a drawing curriculum. Students are not expected to recreate the countries to scale. Nor are they expected to perfectly recreate the shapes of the countries. Students are, however, expected to create a map that demonstrates their amazing new knowledge of European or United States geography. Locate and label each new location on the dashed, black and white map. Draw all of Europe or the United States that has been studied thus far. Days 2, 3: Locate and label each new location onto the dashed, black and white map. Draw all of Europe or the United States studied thus far. Draw and demonstrate, from memory, Europe or the USA. On Day 1 encourage students to make a picture out of the individual country drawing. This will help many students to remember the country’s shape. Drills are an extremely effective practice. Drills can help children memorize large amounts of material in a short amount of time. When engaged in timed drills, children often consider the activity to be more challenging and more fun. Conduct the first few drills without a timer. This will help you determine how much time to give students during timed drills. are a fast, fun, and easy way to give your students more practice drawing. To use the sheet protectors, place the day’s work in sheet protectors, and encourage your students to use dry erase markers to complete the drawings. This will allow them, with very little effort, to quickly draw and erase their illustrations several times, giving them as much practice as possible. If following the schedule provided on page vii, you will notice that on Day 4 students are first asked to list all of the countries they have learned before drawing them onto the blank text box provided. Ready to see Drawing Around the World: Europe? Not studying Europe? Check out Drawing Around the World: USA!